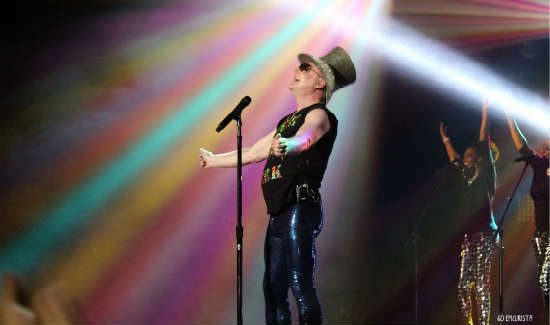 As we anxiously waited for Erasure to take the stage, the DJ primed the crowd for a trip down memory lane with popular 1980s classics including Pet Shop Boys and Culture Club. When the crowd erupted into the chorus for Simple Minds ‘Don’t You Forget About Me’ – “Hey Hey Hey Hey!” – we were right back to 1985, and ready to wear our neon clothes and big hair. A bit after 10pm, Erasure kicked off the show with a fun rendition of their 1986 hit ‘Oh L’Amour’. Andy Bell dazzled in sequined top hat, tux with tails and sparkly black tights and I immediately knew we were in for a fun night. 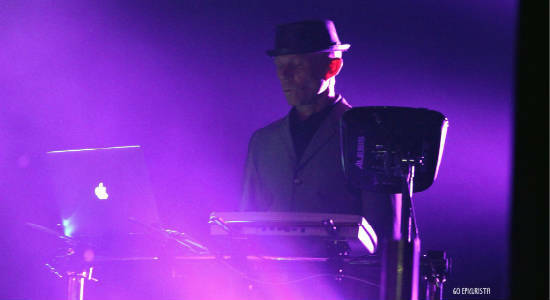 Bell, together with producer mastermind Vince Clarke and two lovely ladies on back-up vocals, took us, happily, toe-tapping and head-bopping back in time. From the start everyone was on their feet cheering and singing along. Well, House of Blues is mostly standing-room only, but nonetheless, even those with seats up in the balcony were all standing and having a great time. Throughout the show we were seamlessly taken back and forth between the 80’s and today. Their greatest hits had the familiar sound we all love, yet sounded more punched up and modern – maybe better tech of today’s world vs. the 1980s helps. The new singles ‘Reason’, ‘Elevation’ and ‘Sacred’ had enough of their signature optimistic lyrics, with a few “oh oh oh ohs” thrown in, to seamlessly mix into the set. Proving Erasure wasn’t all about retro-nostalgia or maintaining the status-quo. So often bands like Erasure can appear stuck in a musical time-warp in order to satisfy fans who don’t want to move on with the times. This creative duo broke free of that loop, as fans cheered for the new songs, even when they didn’t know all the words to sing along to. The crowd, mostly in their 30’s and up with a few younger ones mixed in, was most energized, singing and dancing along, during the popular favorites like ‘Drama’, ‘Chains of Love’, ‘Love to Hate You’, ‘A Little Respect’, ‘Blue Savannah’, and ‘Victim of Love’. Bell still has the range in his voice to pull them off too. This band, as well as the show, is all about optimism and love and I often found myself smiling. The type of smile you don’t think about, but simply creeps up on you from pure joy. That’s what this music is all about. Andy Bell described the show as a “Dickensian Fantasy” inspired by Liza Minnelli and Lucille Ball. The comical fabulousness and theatrics were definitely there. As his shirt proclaimed, he was “werk werk werk(ing)” that modest stage with “vinyl flooring” to the max. Impressive how he can fill the space with his dancing, prancing, and sashaing down the imaginary cat walk. From his outfits, to his persona, to his dance moves – everything from a G-rated strip tease, to ballet, to “Rocky” boxer moves – Bell was his signature flashy, lovable self and the crowd adored him for it. I don’t know how he has the energy to do this every night! Bell’s exuberance and flamboyance, showing pure confidence in the tightest of sparkly short shorts, stands out even more in sharp contrast to Vince Clarke’s reserve and all-business demeanor. Clarke, the show’s wrangler, masterfully orchestrating from his cool laptop, and somehow keeping Andy Bell mildly in check. I only saw Clarke crack a smile once, during the performance of ‘Chorus’, as if giving Bell his stamp of approval or simply giving in to the sheer lightness of his effervescence, just like I did. They appear to have a good relationship and it was sweet to see them coming out hand in hand for the inspiring two-song encore of ‘Always’ and ‘Sometimes”. 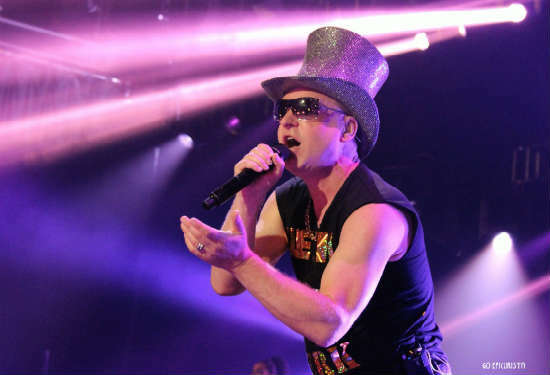 Erasure, with its fun dance beats and Bell’s showmanship can’t be dismissed as fluff. Their lyrics are still as poignant, optimistic and inspiring as they were decades ago. As the show came to an end, I suspect many joined me in thinking how happy we were to see Erasure live in concert. Erasure was an important part of the soundtrack of my teenage years and I always hoped I would get to see them someday. I finally got a chance to #MakeSomedayHappen and that is the happiest feeling of all. If you get a chance to see them in another city, please GO! Don’t wait for “someday”, as it may never come. I promise you will be thoroughly entertained. For more information on Erasure visit Erasureinfo.com. Follow them also on Facebook and Twitter. Hospitality Consultant, Event Planner, Food & Travel Enthusiast, Writer, Brand Cheerleader, Ice Cream Fanatic and eternal optimist on a mission to #MakeSomedayHappen one delicious bite, sip and trip at a time. Celebrating great food and wine with friends throughout Central Florida and around the world at goEpicurista.com. GO celebrate life today, for someday may never come.